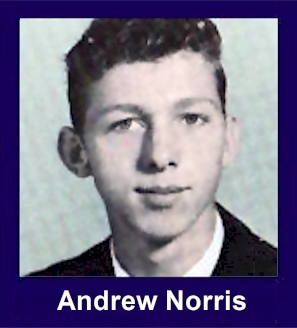 The 35th Infantry Regiment Association salutes our fallen brother, PFC Thomas Andrew Norris, who died in the service of his country on November 13th, 1968 in Plieku Province, Vietnam. The cause of death was listed as Small Arms/AW. At the time of his death Thomas was 20 years of age. He was from Jonben, West Virginia. Thomas is honored on the Vietnam Veterans Memorial at Panel 39W, Line 61. The decorations earned by PFC Thomas Andrew Norris include: the Combat Infantryman Badge, the Bronze Star, the Purple Heart, the National Defense Service Medal, the Vietnam Service Medal, the Vietnam Campaign Medal and the Vietnam Cross of Gallantry with Palm Unit Citation. Thomas was my brother-in-law. He was married to my oldest sister, Drema. I was only 7 years old when Thomas died, but I will never forget the day I found out. I had the little sister crush for Thomas, he was always so nice to me...even when I was a pest. He died way to early. I miss you Thomas. Jackie. I grew up with Thomas. During our school years I looked up to him, even though we were in the same grade. He always seemed to display that unique trait of a natural born leader. I think of Thomas often and the fond memories of our childhood. He is truly a Friend Lost but Never Forgotten.